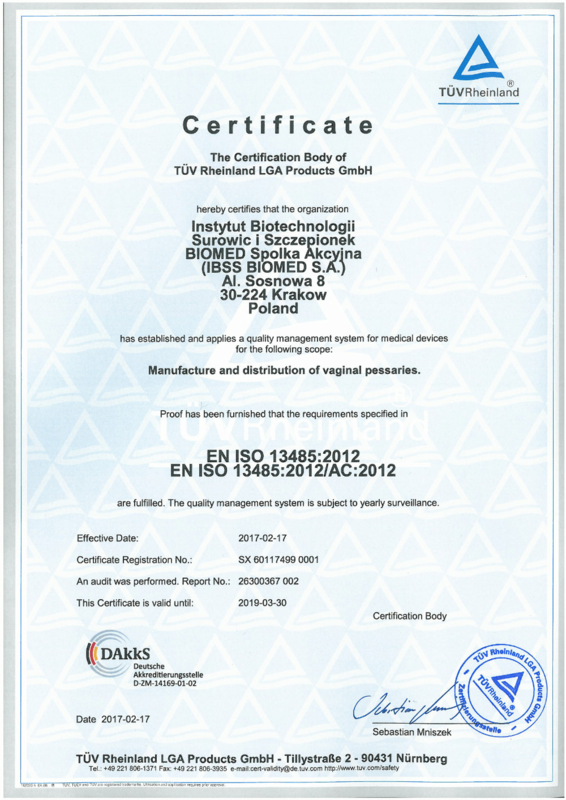 The main objective of the Quality Policy of IBSS BIOMED S.A. is the health and satisfaction of our customers. Finished product Quality Policy in force in the Company is a confirmation of standardisation of the production process and meeting the declared requirements. We take full responsibility for meeting all requirements compliant with Polish law and the highest international standards (GMP, ISO, HACCP). IBSS BIOMED S.A. is subject to regular inspections of the Main Pharmaceutical Inspectorate (Główny Inspektor Farmaceutyczny; GIF) in accordance with the nationwide inspection programme and the Pharmaceutical Law and Certification bodies audits. GMP Certificate of 26.11.2018 confirms that it, the manufacturer, complies with the requirements of Good Manufacturing Practice contained in Directive 2003/94/EC. GMP Certificate of 28.11.2018 confirms that it, the manufacturer, complies with the requirements of Good Manufacturing Practice contained in Directive 2003/94/EC, Directive 91/412/EEC and Art.47 of Directive 2001/83/EC concerning the requirements of GMP for active substances. ISO 22000;2005 certificate valid until 17.07.2021 issued by the Italian certification body CSQA – confirming implementation of the HACCP System principles, i.e. Hazard Analysis and Critical Control Points in the field of manufacture, packaging, warehousing, distribution of food supplements and foods for special medical purposes. The HACCP system has been certified since 2007. Certificate EN ISO 13485:2012/AC:2012 confirming compliance with the requirements of the standard in the field of manufacture and distribution of vaginal pessaries. 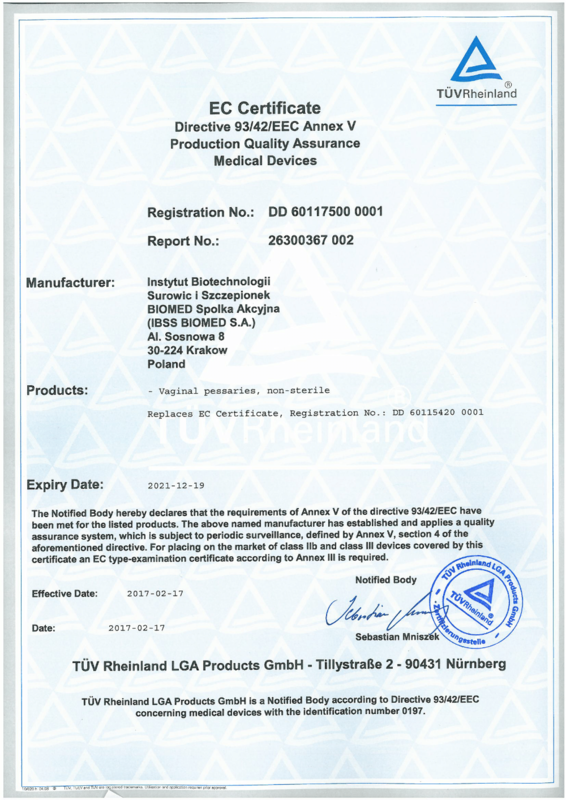 EN ISO 13485 Certificate confirming compliance with the requirements of the Medical Device Directive 93/42/EEC Annex V (Production quality assurance).